"Tiny baby Port Jackson sharks can be seen in October at Bass and Flinders"
When diving out of Port Hacking on Sydney's southern side, we launch our boat at the Yowie Bay Boat Ramp. This is located at the end of Wonga Road, Yowie Bay. Most times when we leave the ramp, even at low tide, we are amazed at the clarity of the water. Over the years we have at times dived off the end of the ramp or under the wharf to salvage items lost (mostly) by other people. In early 2004 St George Scuba Club started doing regular Thursday night dives. Over the years since we have dived most Thursdays, weather permitting. We have our regular spots like Bare Island, Oak Park and Shiprock as well as some other less regular ones. 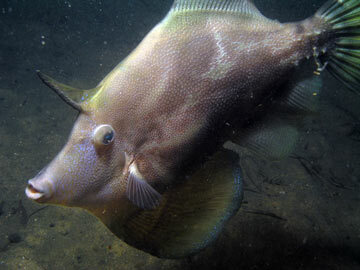 In March 2007 I decided that since the water at Yowie Bay Boat Ramp had been extremely clear, even at low tide, we would plan the last night dive of the month for this location. As mentioned, drive right to the end of Wonga Road and park in the angled parking spots near the boat ramp. As you would only ever do this dive at night (since this a very busy boat ramp, with a marina and wharf right next to it), you will always get parking. You could even park in the boat trailer spots as there is no likelihood that you will be impinging on anyone's spot or get booked by the Council rangers. Remember, you should plan to do this on a high tide (say one hour after Fort Denison high tide). Anyway, after arriving, walk to the wharf and inspect the area. To your left (north) is the boat ramp. This is the entry and exit point. Ahead to the left (north and east of the ramp) is the marina. There are lots of very large cruisers here. To the south of you there are many moorings with medium sized boats as well as a few pontoons attached to the properties. The aim of the dive is to explore under the marina, then the moorings and the shore near the pontoons before returning to the wharf and then the ramp. Once you gear up, walk down to the ramp and carefully enter the water (remembering that the ramp can be very slippery). Once in the water, head east (examine the end of the ramp at the end of the dive), with perhaps a little north. The bottom here is composed of a sandy mixture with a bit of silt. On the night we dived here, the visibililty in this area was not too bad, perhaps five to seven metres. The depth at the end of the ramp is just over seven metres. From here the depth drops fairly quickly towards 14 metres. As you go, look out for the pylons of the marina which do not have that much growth as the marina was rebuilt a few years back. There are also a lot of items on the bottom. These include pieces of marina/wharf, chairs (quite a few) and other things. 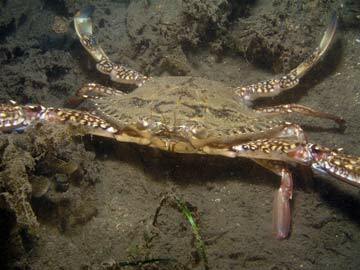 In this area keep an eye out for pufferfish, whiting, fan-bellied leatherjackets and crabs. On our dive here I saw lots of all these. The crabs were mud crabs and blue-swimmer crabs. Once we got to about 10 metres the visibility dropped off dramatically. It soon was less than a metre visibility and very hard to see. We were now under the marina. 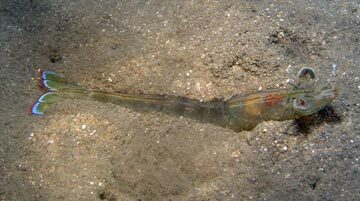 We also found a very large conger eel swimming in the open. In this area navigation got difficult, not only was it very dirty, our compasses played up. We assumed that this was caused by the engines in the boats above, as we headed in a direction only to find that 10 or 20 metres later we were heading in a different direction altogether. We had tried to head south-east back towards the area in front of the wharf but we ended up in the area to the south of the boats. Here we found something interesting. At first, I could not work out what it was due to the poor visibility but then I had it, a car. It at first looked like a ute but I finally worked out that it was a station-wagon which had the rear roof section opened up. It appears that it might have rusted away, bit hard to see. I could not see any wheels so they appear to have rusted off but you can see the steering wheel inside. The windscreen is totally covered in growth. The visibility improved as soon as we left the area under the boats and when we got to the car it was probably two metres. We headed south and soon found a mooring. The visibility came back up to about four metres as we came shallower than about eight metres. Just past here we found a wall. This runs north-south and is very dramatic in some spots. It has some very small overhangs and there is a huge moray eel living here. There are also lots of cuttlefish here. On the sand on the way here and along the wall, there are lots more whiting and also plenty of large prawns. The depth along this wall varies between six and four metres. The wall becomes less prominent in some spots. 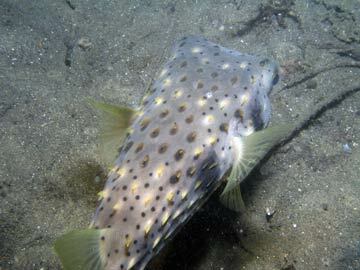 There are more leatherjackets, mostly fan-bellied, as well as pufferfish. If you look up as you go you might see some pontoons. These are from the wharves from the houses to the south of the wharf. About here you should turn around. You can head out east a bit and then back to the north and west . You should strike the wall again. Just past here to the north there is a huge pile of old bottles (beer bottles from about 1965), must have liked a drink the former owners! Soon you will be back at the wharf. Spend some time under the wharf before heading north and finding the boat ramp. Have a look at the end of the ramp. There is a spotted eel living here as well as lots of whiting. Ascend up the ramp and crawl out. On our dive here, the one thing that made this dive memorable was the luminesence. It was simply amazing! When we swam along, the divers looked like ghosts as the luminesence caused a haze around each diver. Even breathing out produced a snowy like appearance. This is not a spot to do more than once or twice, but made an interesting night dive. Remember, listen for boats and if you hear one, do not ascend till its sound goes away.